Today we went to Stanmore later than usual, and bought some cat treats in the form op chewy strips. Mas had bought him some earlier in the week, and Salty loves them. We then went to the Man in the Moon, which was empty except for the staff cleaning and tidying everything up. Apparently we had arrived at the perfect time as a football crowd had been partying there earlier. We had noticed the police van, and five policemen chatting together outside the pub as we went in which had given us a clue. We had a nice roast dinner, and gradually the locals drifted back in, and things got back to normal. When home again Mas gave the cat some of the treats; I have never seen him react to food like this before, and am convinced that they must put some special cat drugs into the food. In the evening we watched LadyHawk which was entertaining. Salty seems rather lethargic, and did not go outside as much as usual. Friday morning, Mas and I went for another short walk; as we left we saw Poppy and Ben and invited them for a meal when it was convenient for them. They said they would like to come over this evening. We saw Margaret, and gave her a birthday card, and chatted briefly. I tidied up somewhat, while Mas went off to gather up a few missing ingredients for the Chinese meal he wanted to make tonight. Poppy and Ben came over as planned, and we had a fun evening chatting and eating; so much more fun than watching TV. Today we had a bit of a lazy day, Mas spent time on the computer, and I went for a walk looking at the architectural styles around Edgware. 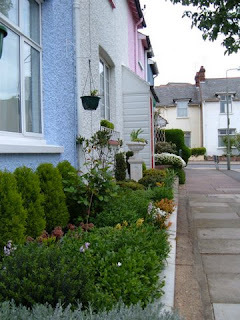 In particular at some houses in a small road called Garden City where each house is painted a different pastel colour . They were built in 1920 by an E. Appleby. In the evening we watched one of the Rosemary and Thyme series. 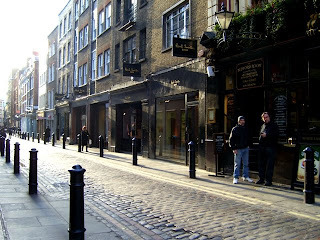 I spent most of the day pottering about, and in the afternoon I went for a walk and picked up a little shopping. Mas went off to Edgware General Hospital for a hearing test; he has some hearing loss and will see if he finds hearing aids helpful. We watched an NCIS in the evening, and went to bed fairly early. Today after breakfast Mas and I went off for a short walk together for the exercise,and later I went for a longer walk on my own. It rained heavily all afternoon; Salty rushed indoors looking as if he had been electrocuted...all his fur was stuck together in points, he was really soaking, and his tummy was all muddy. 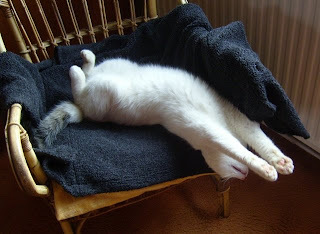 He threw himself down on the carpet, and within half an hour he was dried, fluffed up again and white! 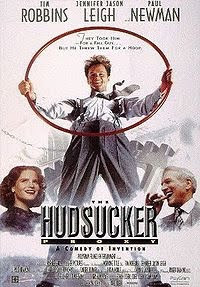 In the evening we watched an old tape of The Hudsucker Proxy which was a very strange film with Tim Robbins and Paul Newman in it. The scenery and graphics of the film were strange futuristic/ art deco for the period of the 1950s, but fascinating. It was raining all night, consequently, the cat was running boisterously around the house, and tearing up and down the stairs, going head over heels, but catching onto steps with his claws to prevent himself from crashing down the flight of stairs in the nick of time. All this kept me awake, so I listened to the radio quietly for hours, and felt tired all day. While we had breakfast we watched the snow swirling down, but it did not settle. For some exercise I vacuumed violently and excessively, before settling down to more peaceful occupations. I am so bored by this weather. Today I walked with Poppy and Ben in the park, watching Lilu frolic around. There were other dog walkers too, and we met Jim with his elderly dog. I had not seen him around for a while, and he told me he had recently had a hip replacement, and had been staying with his son while he convalesced. Mas had invited Poppy and Ben to come for one of our cheapy pub lunches, but Ben was on call, and had to urgently leave. Poppy called to say this may take some time, so Mas and I went off to the Man in the Moon, as we came back it snowed, and then sleeted. Later, Poppy and Ben invited us to go out for an evening meal with them, and have some Persian cooking. 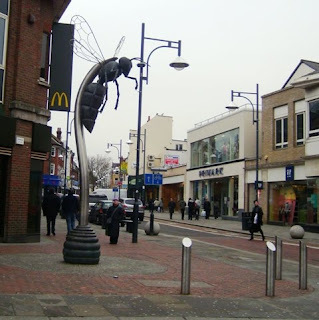 We drove off with them to Finchley Central and went to a restaurant called Shiraz which was peacefully appointed, and with friendly service. We had a really nice three course meal with wine, and Poppy and I had Persian tea afterwards, which was amber coloured, clear and delicately scented. Mason, unusually, really liked the wine very much. Really, just the very tasty starters would have been ample, but it was interesting to try all the different flavours, and we had a really nice evening. Later on, just as we were thinking of going off to bed the cat bought in another minute mouse. I managed to take it away from him and put it outside again, but I don't know if it had been hurt too much to survive. At this rate I think I will have to try and find a small robot mouse for him to chase, otherwise the area will be denuded of wildlife, or at least mice. We had breakfast, with the sun shining for a change. Salty was particularly happy as he could pounce on, and watch the small rainbows that came from the hanging crystal. We arranged to meet Tania and Robert at Sazios for lunch. Just before we left, I realised that I had written down the date for our visit to the theatre in the wrong month in my diary, and that we had missed the show by four days! I was so mad I felt like stabbing myself, especially as this was a gift from Romy and Toby. We drove off to St.Albans, and had a really nice lunch with Tania and Robert, and I told them about some of my pictures being used on television. As I was driving back home the weather got colder, and it began to snow, and we thought how lucky we had been with our timing, getting lots of fruit and vegetables from the market before the snow came. In the evening we watched an NCIS, and then I left Mas watching TV while I listened to my new Nocturnes CD and did some knitting for a change, but kept thinking about our missed theatre outing. We had eaten so much at lunch that we did not bother to have an evening meal. We had breakfast with a snow shower, and this gradually changed to rain. Mas phoned up about the theatre tickets, and they were very nice saying we could go on another day, but to return the tickets. I felt so relieved. I called Jean in Devon and talked to her for a long time; there was a lot to catch up on as we had not seen each other for years. I felt really happy to talk to her, and will try to call her more often. I discovered that my pictures had already been shown on the BBC, on Click Bits on Friday, and L J Rich the presenter thought they had looked lovely on screen. Toby called to talk, and Pete too, so it was a great day for communications. After having pains in one calf all night I got up early and went off to the hospital in case I should have DVT. After having my leg examined the doctor thought it very unlikely, as my leg was not swollen, the veins did not hurt, and the calf was soft when relaxed. I left reassured if somewhat sheepish, but reminded myself it was better to be safe than sorry. Walking home, I met Ben who was walking towards the park with Lilu. We chatted for a while, and as it happened Ben had been out for a coffee with Mas while I was out. I had a lovely surprise when I got home as Jana had sent a letter full of news together with a CD of Chopin Nocturnes; the good news is that she will be coming over in April for a holiday. I really like these Nocturnes, and recalled how often while waiting for the Wednesday or Saturday play on the radio, BBC Home service, they would play a Nocturne first, which is how I became familiar with them. In the evening we watched The Mentalist which is silly, but entertaining. We woke up with snow falling, but later in the day it turned to rain. We made some French Onion soup, with bread and toasted cheese on top, for lunch, and watched a Murder She Wrote in the afternoon. L J Rich accepted all the pictures I had forwarded for Click Bits, so I cheerfully, and carefully, sent them off again in a higher resolution. Mas called me while he was watching TV; Salty had bought in a mouse which was running round the room. We tried to catch it before the cat did, but he went under the couch and we could not see him. Later in the evening the cat found him again, so we were rushing about trying to get him into the conservatory with the help of a soft broom, so that he would not set up house in our home. Eventually after we had opened the conservatory door he left quickly. We settled down to finish what we had been watching, and after a while the cat went out. In a short time the cat bought the mouse in again, but this time it was dead. As it did not appear to have any injuries we thought he must have had a heart attack. The cat in the meantime was very excited and playful, and obviously thinks he is the Great White Hunter. Mas and I got shopping in the morning, and despite it raining most of the day I walked with Margaret, and Henry the dog, over to Edgwarebury Park. 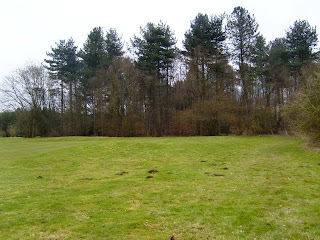 The ground was very boggy and waterlogged, but despite this, Henry spent some time joyfully rolling on the grass. Even though the weather was so bad we felt better for the walk. I spoke to Pete today, and later had an email from Mex telling me that Click Bits on the BBC was looking for artwork, so I sent off six pieces to L J Rich the presenter in the hope that one would be suitable. Today I had a dental appointment for a small filling which left my nose numb almost till bedtime. Luckily the weather was bright, but cold, and I went by bus. Waiting at the bus stop after the dental visit, the bus queue watched warily as a man hurled abuse at a kebab eatery close by; the owner meanwhile locked his glass front door to keep the man out, and we watched in disgust as he spat at and licked the window. Mas in the meantime went and got some more shopping that we needed, especially fish for the cat. In the evening we watched an NCIS. Today Mas and I went to Stanmore to get shopping, but went to lunch instead at the Man in the Moon. I had to hurry back as I was to meet Margaret so that we could walk Henry. As I approached their house I saw John was getting his car ready. We all drove off to Berry Grove woods, near Aldenham, and walked for more than an hour chatting and watching Henry cavort about joyfully. It was a very cold day, with the occasional snow flake feathering down. We saw tree fellers felling trees, looked for Muntjack deer, but did not see any, saw some signs of life with buds on trees and catkins . Wall Hall was built in the 1800s, later it became a teacher training college, and now has been converted into flats. As we began to head back to the car the snow started falling faster, but luckily did not last for too long. I really enjoyed this walk, and felt about twenty years younger when I got home again. Mas had been for his doctors appointment, luckily just a routine one. 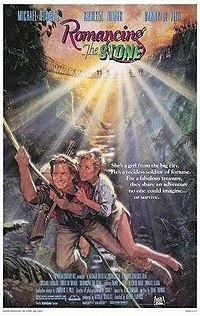 In the evening we watched Romancing the Stone, which although we had seen this before was quite fun. We had a quick tidy up, and organised the meal we would make for Eileen, Nina and my brother Alex. Diane phoned and chatted for a while during the afternoon. Both Mas and I were feeling particularly tired today, and think that the dreariness of the cold day does not help. The family arrived just past seven in the evening, and we sat in front of the warm fire drinking gin and tonic by candlelight while the meal finished cooking. We had plenty to talk about as we have not seen each other for a year. Mas made a Christmassy meal with turkey and all the fixings, which we had after the nice sweetcorn soup he makes. Everyone seemed to enjoy the meal and the conversation. Alex and I having the chance to snicker at things a couple of times, as we share the same sense of humour. After a nice but exhausting evening we tottered off to bed without clearing up first, which is unusual for us. It had been fun though. This morning I cleared up, but still felt tired. Later as it was Ashworthy's birthday I dropped off a birthday card and set off to walk for an hour. After a short walk I saw Margaret walking with Henry the dog, so I walked home with her chatting; it was too cold to stand and talk. As we approached her house it began to rain, so instead of walking I went in with her and had tea and bread pudding with her and John and chatted for a while. We planned to walk tomorrow with Henry if it was not snowing. Back home again Mas mentioned regretfully that he had forgotten it was Valentine's day. After all this time together I don't think we need reminding how we feel about each other! In the evening we watched The Lost World with Bob Hoskins, James Fox and Peter Falk which was entertaining. Mas and I went to Stanmore to get shopping, and had lunch at the Man in the Moon which was a welcome break. Pete sent me some of his poems to read, and I heard from Joan too. In the evening we watched this French film, Brotherhood of the Wolf which was a stylish historical horror film, but very entertaining, and ate homemade bread and butter pudding. Today we had a busy day catching up with correspondence and doing various chores. Diane called with family news, and Alex called to confirm that they would be coming over tomorrow for a visit. 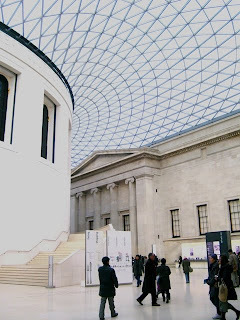 Today I went off to the British Museum and met Pat as arranged on the steps outside with the odd snowflake falling. We wandered around the museum until we found the Staffordshire Hoard display : two small cases displaying a few broken sword handles, coins and broken bits and pieces. Pat was very disappointed at how little there was to see, and she said if she had found any of it she would not have bothered to pick it up. The bulk of the hoard is being cleaned and valued. and found The Stockpot for an economical lunch. The Stockpot was filled with people; it was mostly the pre matinee crowd. 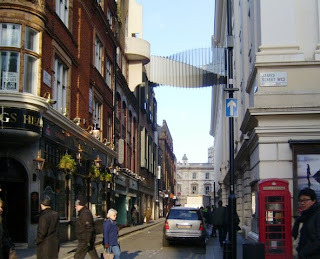 We had a filling lunch, and when we left decided to walk to Covent Garden and see what was going on there. We passed this interesting bridge which I had never seen before. 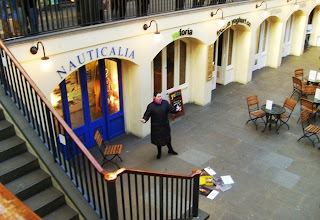 Once in Covent Garden we heard this lady singing opera to a small audience as it was so cold. 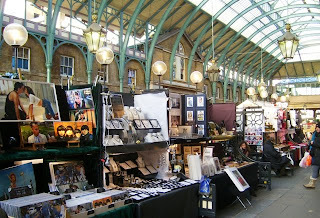 There were all the usual stalls set out, but not many people around looking at them. 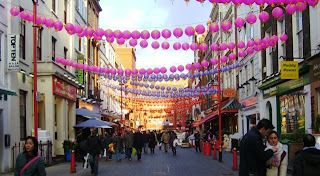 When we left, we walked to China Town to look at the decorations. 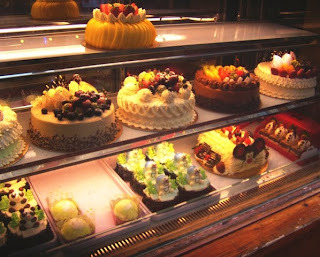 I saw these interesting cakes in a baker's window, and a tall man asked if I wanted a picture of me looking at the cakes longingly. When I showed him the cakes, he told me it would be the year of The Mouse soon, but the cakes didn't look like mice to me. Later, walking back, the same man hurried over to me and said he was sorry, but the next Chinese year would be the year of the Tiger, he said he never made mistakes, but when he did he wanted to put them right. Pat and I walked back to the tube, and took the Northern Line home, to the opposite ends of the same line. In the evening Mas and I watched a new episode of Midsomer Murders with John Nettles which was fun. Monday it snowed all day, and was very cold. I walked to the post office and renewed my travel pass and chatted to the nice post lady for a moment. Christane dropped of some shopping bags for us that she had collected from a travel exhibition. Mas was busy all day, and I felt bored an lifeless because of the weather. I have many things I could be doing, but can only manage enough enthusiasm to read; thank goodness for books! Today we had snow while we had breakfast, but it did not really settle. Mas dropped me off at the dentist ( a new one to us) who is quite near to where The Red Lion pub used to be in Colindale. The dentist seemed quite pleasant, and thorough; I have to go back next week for a small filling. After this I went for a short walk before going home again. Today we drove off to St. Albans; the weather was still very cold. We met Tania and Robert, and as the place was filled with youngsters, as there must have been some event going on in town today, we decided to go to another Thai restaurant for a change, which was situated in a quiet alley way. We had a lot to talk about which was fun, but I thought that the food was very bland compared to the Bua Thai. In the evening we has a colourful salad with lots of pungent guacamole. I watched another episode of Island Parish which is currently my favourite programme. On Sunday we kept ourselves busy catching up with things and people. I phoned and chatted to Astrid who I have not spoken to for a couple of years, but we have known each other for a long time now; she has a distinctive laugh. Toby called as well which was cheering. Poppy has been ill, but is feeling much better now. I also called Pat and we arranged to meet up next week. Yesterday morning I noticed Salty was covered in fleas; I had forgotten to Frontline him a week or so ago. I took all the fleas off him that I could see, which took a long time, and I put the Frontline liquid on the back of his neck. Not long afterwards I found I was covered in bites too, so stripped off my cloths and put them straight in the washing machine, and had a shower. I sprayed around the house in places that Salty sits, and washed his blankets and cushion covers. Mas and I went out after all this, paid bills and had lunch at the Man in the Moon. Later I went for a walk for the exercise, and bought a flea collar to put in the vacuum cleaner. Today I noticed I had more bites, so took the same procedure as yesterday, and vacuumed the whole house, and gave Salty fresh bedding again. I noticed that he was not sitting or lying in any of his usual places which must be a natural defence mechanism for cats who have had fleas. At the end of the day I had no fresh bites so believe the fleas have packed their bags and left! Whew! I met Christiane as arranged at the bus stop at 11.30 in the morning. We sat upstairs on the bus and went to Watford. We walked up the High Street, and I photographed this statue, and then my camera batteries ran out! The weather was very cold, but we had time to look in one of the charity shops before deciding that we had better see exactly where the Watford Colosseum is. Having found it, we went into MacDonald's and had a small sandwich and coffee each, and Christian had bought some very nice French cake with her too. Feeling better we walked to the Colosseum where there was now a long line of people waiting to go in for the concert by the BBC Concert Orchestra, a programme for radio 3. While we hesitated, a man asked us if we would like to know a short cut to the entrance, and following him we went through the council offices, and out again, and came out near the end of the queue. I noticed how smart he looked, and as if he had just left the barbers, as his hair looked immaculate. We were soon seated in the Colosseum with an excellent view of the orchestra. We listened to music by Balakirev, Mendelssohn, Prokofiev, Benjamin Britten (Four sea interludes from Peter Grimes), Copeland and Ravel. We had a short interval, but did not leave our seats. We noticed that the man who had shown us the shortcut was playing a cello in the orchestra. The conductor was Keith Lockhart. It was a very good concert which we both enjoyed. When we left, Christiane bought a butterfly dish as she was going to make a grandchild a butterfly birthday cake, or more accurately, a two butterfly cake. We took the bus back, me getting off in Edgware, and Christiane travelling further. It had been a really nice day. When we woke there was another thin covering of snow outside and as it was sunny we got some shopping in Stanmore, and I bought myself a blue fleece top. On Sunday we went to The Man in the Moon and had a roast Sunday lunch which we enjoyed and lingered over. the barman let us buy several bottles of the wine which was very nice, and we took them home for another day. Later Florence called and chatted, and I called Poppy who is starting a new job tomorrow. On Monday I went off early to have a blood test at the hospital, and then I walked up to Hampstead looking at the shops, and getting some stamps at the post office. On the way home I bought two fresh herrings for my lunch ( Mas does not like herrings as they, inconsiderately, have too many bones; the cat enjoyed the leftovers (minus the bones). Today I went back to the Royal Free Hospital where I saw the specialist with the smiling eyes. He said my blood tests were all normal, and reminded me that I must walk each day, and not gain too much weight. Further appointments were set up for me, which makes me feel very secure in the knowledge that they are looking after me so well. 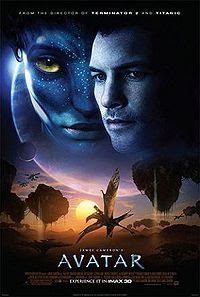 I hurried back home as we had planned to see Avatar in the late afternoon. It was a beautiful film, the scenery was amazing, and the love story good too. I was surprised that they had made such an obviously political statement, without any use of subtlety, which I think would have made the message more meaningful, instead of using crude stereotypes. 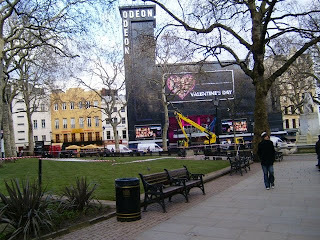 It did make a change for us to go to the cinema, and go out after feeling so confined by bad weather.